The debut of Iréne Theorin, one of the greatest Wagnerian sopranos of our time, on the title role was the main feature of the restaging of La Gioconda at Liceu. The opera by Amilcare Ponchielli – the only one by him remaining in the repertoire – moves very awkwardly, as it doesn’t fit anywhere, in the space in between post Verdi and Verism. This wasn’t possible. A few hours before the opening, the theatre announced that Iréne Theorin, still convalescent from pneumonia, was cancelling her performance and that Neapolitan soprano Anna Pirozzi, from the second cast would sing in her place. The audience didn’t take it very well. Anna Pirozzi didn’t have it easy. Practically unknown to the theatre’s audience – she had only sang at Liceu in two performances of Attila in concert version – she had to convince us that she could also be a solid Gioconda, and she did. In the first act, she reserved some of her energy but in the following she deployed a powerful dramatic soprano voice with nice lyrical elan when necessary. Her “Suicidio!”, her main intervention, was strong and her singing was sweet in the final scene. The audience praised her effort with a long applause. In the rest of the cast there was a little bit of everything. Dolora Zajick, who debuted at Liceu 30 years ago and who has already announced that she will retire professionally in 2021, is in great vocal shape. Her Laura, Gioconda’s love rival, was magnificently sung. Scenically, however, she didn’t render the character at all and, battling with a scenography that made her go up and down the stairs constantly, she and we struggled. María José Montiel delivered a good Cieca, Gioconda’s mother. However, a darker tone and greater lower resonance would have gone well with the mysterious character. Brian Jagde, debuting at Liceu, is a brave North American tenor, with a potent voice and not very refined style. In the role of Enzo Grimaldo, his “Cielo e mar!” became more stentorian than beautiful. The character afforded more. Ildebrando D’Arcangelo was singing the role of Alvise Badoero, the Venetian Dux, Laura’s husband. He delivered, but in his main intervention at the beginning of the third act the lower register remained often under-sustained. The most dramatically gratifying role in La Gioconda is Barnaba, the sadistic, sinister and lascivious spy at the service of the Inquisition, a worthy heir of the Verdian Iago. The character was very well portrayed scenically by Gabriele Viviani. Vocally it remained correct but not memorable. La Gioconda includes the famous ballet ‘The dance of the hours”, which was very satisfactorily resolved in the soloist parts by Alessandro Riga and Letizia Giuliani. The orchestra and choir worked well in the hands of another debut, the Madrilene conductor Guillermo García Calvo. 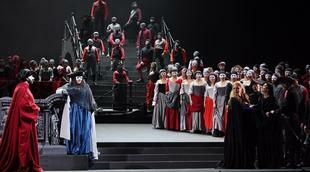 The production that was presented at Liceu of this imperfect, dark, gruesome opera of unnecessarily and pointlessly complicated plot was a restaging, allegedly renewed, of the production premiered in 2005 with stage direction, scenography and costumes by Pier Luigi Pizzi. The production, visually dull, uninventive, with excessively conventional actors’ direction, didn’t work 15 years ago and, despite the renovation, still doesn’t work now. On the 10th April La Gioconda will be broadcast live from Liceu in cinemas around the world. It might be that selecting this title for broadcasting from Liceu this season wasn’t the best choice. La Gioconda by Amilcare Ponchielli. Anna Pirozzi, soprano. Dolora Zajick, mezzosoprano. Ildebrando d'Arcangelo, bass. María José Montiel, mezzosoprano. Brian Jagde, tenor. Gabriele Viviani, baritone. Alessandro Riga, main male guest dancer. Letizia Giuliani, main female guest dancer. Orchestra of Gran Teatre del Liceu. Choir of Gran Teatre del Liceu. Guillermo García Calvo, conductor. Pier Luigi Pizzi, stage director, scenography and costumes. Georghe Iancu, choreography. Co-production by Gran Teatre del Liceu, Teatro Real de Madrid and Arena di Verona. Gran Teatre del Liceu.